Retailers are preparing for one of their biggest weekends of the year as an estimated 164 million people are already planning to go shopping Thanksgiving Day through Cyber Monday, according to the annual survey released Friday, November 16th by the National Retail Federation and Prosper Insights & Analytics. 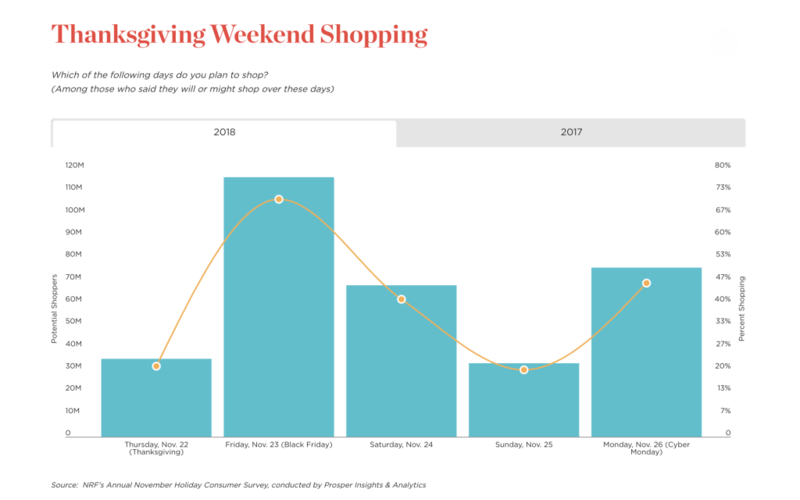 The survey found that of those planning to shop during the long holiday weekend 21 percent (34 million) plan to shop on Thanksgiving Day, but Black Friday will remain the busiest day with 71 percent (116 million) planning to shop. Forty-one percent (67 million) are expected to shop on Small Business Saturday, and 78 percent of those say they will do so specifically to support small businesses. On Sunday, 20 percent (32 million) are expected to shop. The shopping weekend will wrap up on Cyber Monday, when 46 percent (75 million) are expected to take advantage of online bargains. Of those shopping this year, 65 percent said they are doing so to take advantage of deals and promotions retailers will offer, while 26 percent cited the tradition of shopping over Thanksgiving weekend and 23 percent said it is something to do over the holiday weekend and the same number said it is when they start their holiday shopping. The survey, which asked 7,516 consumers about their shopping plans, was conducted October 29-November 7 and has a margin of error of plus or minus 1.2 percentage points.